Selecting which type of lumber you use for a project depends on its ultimate purpose. For structural needs such as joists or beams, the look of the lumber isn't a top priority. But if the lumber is going to be visible, you may want a higher grade of lumber. This guide will help you understand the measurements you need for your project, as well as steer you in the right direction when making lumber choices. The foundation and framing step is when you begin to see your house take shape! You'll see the concrete slab or the start to a basement, and soon there will be exterior walls, which means you can see where your rooms, doors, and windows will be. Check out our building materials buying guides for information on most of the materials you'll need for this step in building your home. Lumber that is 2-4 inches thick by 2-4 inches wide is graded as a Stud. Studs are the vertical pieces of wood used to create the frame of a building's wall. Studs are simply dimensional lumber pieces sized specifically for wall framing. Dimensional lumber is wood cut to standardized sizes by width and depth (in inches). 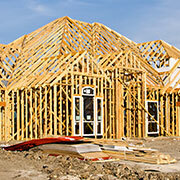 Builders use it extensively in framing wooden buildings. The most common dimensional lumber sizes are 2×4, 2×6, and 4×4. 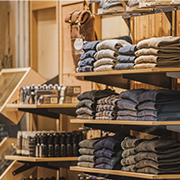 Length of dimensional lumber varies greatly from 6 - 24 feet. Dimensional lumber is high quality, meets building codes and is perfect for framing buildings, making furniture and woodworking hobbies. Select structural lumber is mostly free of defects and knots. Any knots found on this type of wood will be small, firm and tight. It is the highest grade of lumber and is used for its strength and durability. All select structural lumber is found in standard dimensions of thickness and width. Most being a 2x4 or 4x4 that is 6, 8 or 10 feet long. The pre-cut sizes allow builders to buy lumber that does not need to be cut before starting construction. Engineered lumber is made from wood veneers (typically poplar, pine, or fir) and wood particles that are laminated together under heat and pressure with a moisture-resistant resin. It is used to create large structural elements that will virtually never fail. The most common engineered wood products used in framing include LVL (laminated veneer lumber) beams and I-joists. These pieces are manufactured in a controlled environment and the load factors are calculated for every size. Engineered lumber also uses more of the whole tree than other sawn lumber options. This means that more trees are saved in the process because fewer need to be cut down. Louisiana Pacific has a line called LP SolidStart Engineered Wood Products that works for basically every framing application used today. Their products provide greater strength, size, stiffness and longer lengths than any traditional lumber. All LP SolidStart is also backed by a lifetime limited warranty. Engineered wood laminated columns are typically made from #1 SYP (Southern Yellow Pine) and used in post-frame construction. A Lumber Tech column is engineered and manufactured with state of the art technology. They use a truss ready Mega Spacer to supply the most user friendly and time saving column on the market. There is fire retardant wood that has a treatment applied during its manufacture that creates a built-in protection from flame spread and smoke development. It doesn't require much maintenance and also prevents damage that can be caused by termites and fungal decay. When it comes to this type of lumber, Dricon Fire Retardant Treated (FRT) wood provides an unmatched record of protection. When Dricon is exposed to fire, it will automatically react with combustible gases and tars to convert them to carbon char. Using carbon dioxide and water. These harmless vapors will dilute the combustible gases and reduce flame spread and smoke. 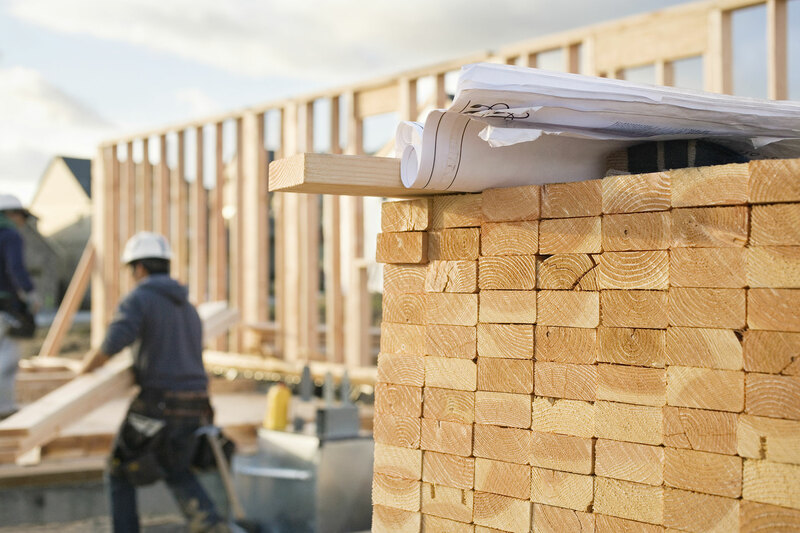 The lumber needed to create the building frame must be held together using structural connectors to ensure a strong and safe wood-framed structure. Heavy duty hardware is used to connect large pieces of lumber in the creation of a buildings frame. One of the largest manufacturers of these construction connectors is Simpson Strong Tie. They manufacture a variety of structural connectors, fasteners, fastening systems, anchors, lateral systems, software, and concrete repair, protection and strengthening systems. When creating a buildings frame, Simpson Strong Tie will have the connection solution needed for your job. Along with construction connectors, structural wood screws are needed when constructing a buildings frame. These screws are heavy duty and designed to make long lasting connections. 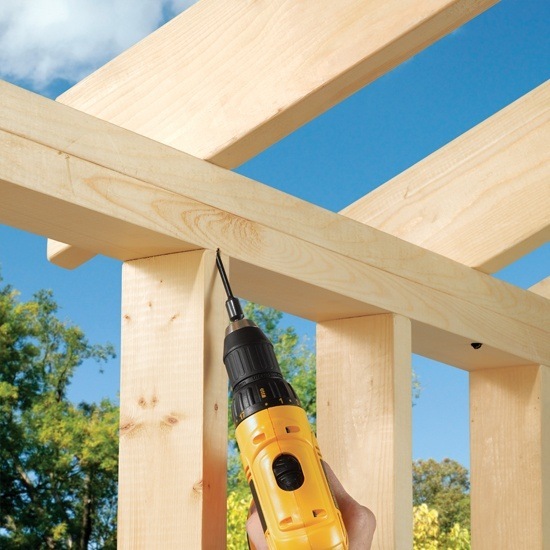 FastenMaster is a brand offering a full LOK line of different structural wood screws. They make it easy to find the right screw for your construction project. 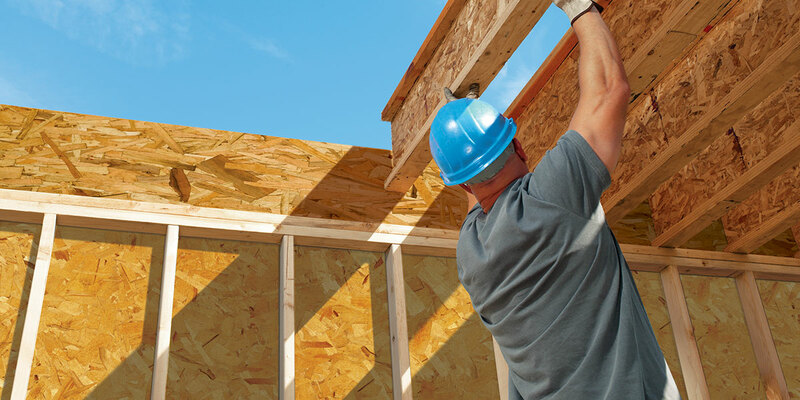 Installing a home's insulation should be done after the frame is completed. There is exterior and interior types of insulation that must be added to the structure. The exterior insulation is often called house wrap, and is a sheathing applied to the exterior walls and roof. Interior insulation is typically placed inside all exterior walls, attics and floors. Insulation is used in order to keep the home at a consistent temperature and improve its energy efficiency. Once the skeleton of the house is completed, it must be covered with a protective barrier known as house or building wrap. This barrier prevents water from infiltrating the structure and causing damage like mold or wood rot. 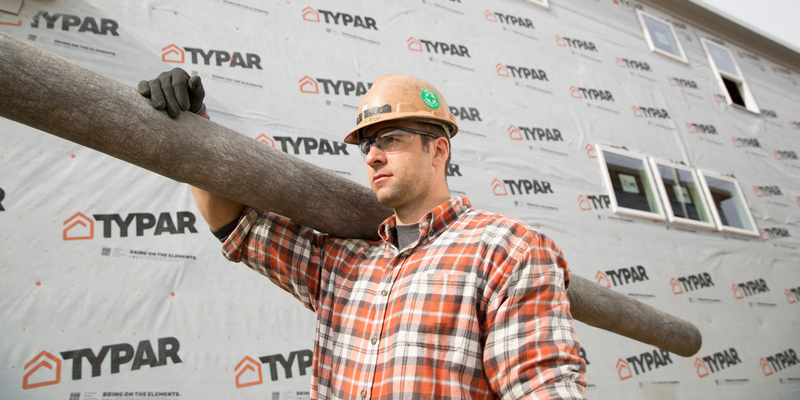 A long-time trusted house wrap (building wrap) comes from the TYPAR Weather Protection System. The TYPAR Building Wrap has extraordinary tear strength, blocks air and water, lets moisture escape, resistant to oil, tannin and soap damage, has UV stability and is incredibly versatile. Compared to traditional types of insulation like batts, blankets and loose-fill, structural insulated panels will provide superior energy savings. The Atlas Energy Shield Insulation Sheathing Boards are a cost effective and energy efficient product for insulating a residential and some commercial construction applications. These panels are composed of a closed cell polyisocyanurate (polyiso) foam core that is faced with trilaminate foil. They range in sizes of 4ʹ by 8ʹ to 16ʺ or 24ʺ widths. Custom sizing is also available. The roof is another area of the structure that will need proper protection from air and water. Once the roof is completed with sheathing, it will need to be entirely covered and weatherized. A roof underlayment is a water-resistant barrier that is installed directly on top of the roof. It is the step after wood sheathing and the step before applying materials like shingles. This system will cover the whole roof and protect your home from the elements. 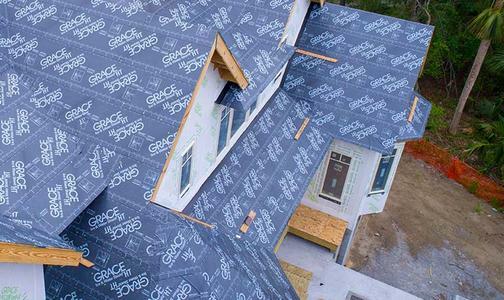 GCP Technologies (formerly Grace) provides high-performance roofing underlayments, including Grace Ice & Water Shield, that have been contractors' trusted roof protection solutions for decades. Their underlayments are self-adhering and deliver the most superior waterproofing performance even in the most severe climates. Although a structure needs to be covered and protected with different materials, there also needs to be openings that provide airflow throughout it. A proper ventilation system keeps the air inside a building fresh and healthy, so that moisture, odors, gases, dust, and other air pollutants do not build up inside. Good air quality is the key to a longstanding, happy and healthy home. The vent manufacturer Lomanco lives and breathes by that statement to create state-of-the-art vents with proven performance. Their product offerings include turbine vents, ridge vents, static roof vents, intake vents, standard power vents, solar power vents, gable vents, foundation vents and even a variety of specialty vents. Lomanco makes it easy to create a proper ventilation system in any home. 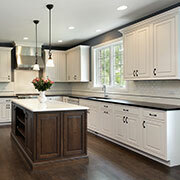 Doors, cabinets, and cupboards require the appropriate hardware to operate correctly. Many common systems like these use slides, guides or tracks to function. Manufacturers like Sugatsune and Knape & Vogt provide these various systems sizes and styles of sliding door hardware that will be perfect for any door in your home. Do not overlook the convenience and importance of installing coat and hat hooks in your home. The storage and organization spaces in any home are greatly desired and valued. Installing high quality Ives coat and hat hooks contribute to the overall functionality of a space. Ives coat and hat hooks come in practical, appealing designs and colors that will satisfy the storage and organization needs of any space. Once there is wiring and walls it is time to add some decorative flair. Wall and switch plates are essential items in every home or building. They conceal unsightly wiring and protect users from harm. Amerock offers a large selection of these switch plates in various designs, materials and colors for modern, traditional or styles in between. This simple accessory can truly add to overall look and aesthetic of a room. Every structure imaginable requires area for storage, so including some type of shelving will be necessary. Many buildings also have more than one story and will require the installation of stairs using treads and stepping. Both of these systems can be created using products from Roseburg. Roseburg makes shelving products and UltraBlend Stairtreads, which are the perfect solutions for creating storage and stairs for your project.